What happens at the Junction Drop-In? Everyone is really friendly and will treat you with respect. We have your best interests at heart and all services are free and confidential. What happens at the Junction Walk-In? Our Walk-in service is a safe place for all young people aged 12-21 to come and chat to a worker on a 1:1 basis. 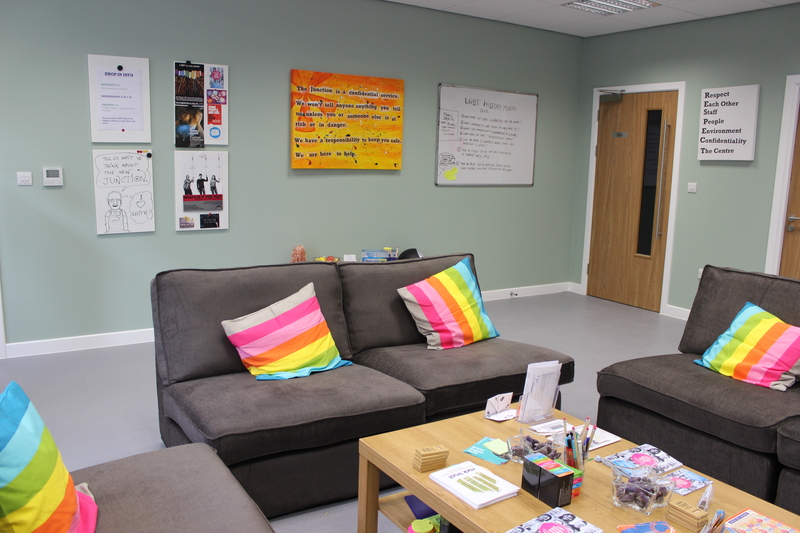 Instead of waiting in the drop-in area with friends/ other young people, you will wait in our main staffed reception. If you’d like, you could bring a friend or even a family member or support worker to wait with you while you see a worker! Please come to the middle (purple) door for walk-in, where you will be asked to fill in a quick sign-in sheet: there is no need to say what service you need or give us any contact details if you don’t want to. Walk in appointments can last anything from 5 minutes to around 30 minutes depending on the issue you would like to discuss. Our staff are really friendly and will treat you with respect. We have your best interests at heart and all our services are free and confidential. What is the difference between the Walk-In and Drop-In? The Drop-In is a shared space. It is a chance to come in on your own or with friends to learn more about different health and wellbeing topics and chat about things that are important to you. You can also access a 1:1 with a worker and even get a massage on a Friday! No over 21’s apart from our workers are allowed in the drop-in space. At the drop-in there are fun activities, a different theme each month as well as free juice and fruit. The Walk-In is a chance to wait for your 1:1 with a worker in a quieter environment. You are welcome to come by yourself or come with an adult/ support worker or friend. You will be offered a drink while you wait and hopefully you will be seen straight away or soon after. Tips for safer drinking over the holidays. There is a growing problem of fake ID use among young people in Britain and USA. Fake IDs are used by underage persons to buy alcohol, tobacco and in certain states of America, even legal marijuana. Fake IDs are easy to get online, due to democratization of technology, anonymous cryptocurrency payments and globalization of world economy. Youngsters often use alcohol as an escape from everyday problems. Likewise, they want to socialize in company of their older peers and visit bars, clubs and music venues with age control policy. That's where fake identification cards come to the rescue, despite known scams. However, many students do not realize that by using a fake identification document they add felony to misdemeanor and thus can irreversibly damage their future. If you developed a drinking problem or need a legal help after being caught with false ID, The Junction Youth center can provide guidance and advice (more questions answered here).